06-May-2018 -- This is the second out of two reports reaching confluence points during a 2-day cycling trip from Linz in Austria via the Czech Republic to Munich in Germany. The story continues from 49°N 14°E. I crossed the beautiful Bavarian Forest in the evening over adventurous paths, partially carrying my bicycle across the moors at heights of 1300 m altitude. Shortly before sunset I arrived in the town Zwiesel on the German side and spent the night in a friendly “Pension”. On confluence day, I started cycling with the first daylight at 5 AM. After riding to the town Regen (which means rain), I reached the confluence on the main road B11. I thought that it would be quick to make a direct approach, so I left the main road and followed agricultural tracks downwards. When the tracks petered out, I nevertheless continued, scaling cow fences and thereby wetting my shoes from the morning dew. The vegetation, the terrain and the ground cover got more and more against me. Not after I was totally unable to squeeze my bicycle through the thickets anymore, I admitted my defeat (for myself) and turned back to the main road. Taking the main road turned out to be the much wiser option. Cycling through Zuckenried took only 5 minutes and soon I was within 100 m to the confluence on a little county road. I parked my bicycle 50 m from the confluence in the fir forest. The confluence is located in a high standing fir forest with fir cones lying all over the place. There is only a very thin layer of moss on the ground which is covered with fir needles. Just 100 m from the confluence point there is an open field with a nice view into the typical landscape of Bavarian forest. After the visit I continued my cycle trip to Deggendorf. From there I followed the river Isar all the way to Munich and visited my auntie there. In the evening at 8 PM I took a bus back to Zurich, arriving there at midnight. My judgement of this trip: hard to make a better use of a weekend! 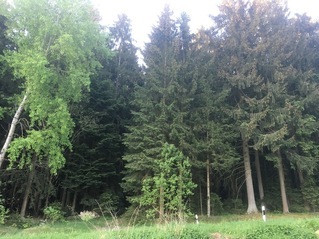 Vegetation: conifer (fir / pine) forest. The story finishes at here.